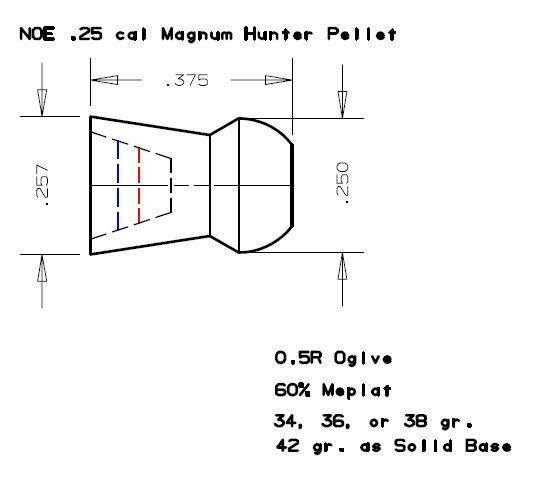 I’m thinking that .25 wadcutter at 22 grains may be the best bet for my Hatsan 1000x. Opinions? I think it would be very effective squirrel medicine. 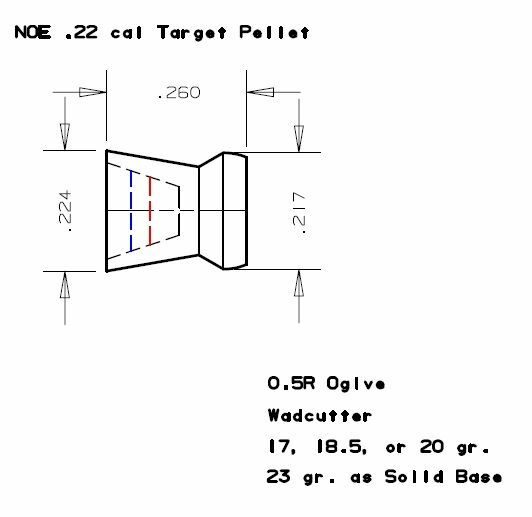 My experience with wadcutter pellets is limited to 177. They seem to do better at lower velocity. I had a PCP silhouette pistol that would shoot pretty accurrate to 40yds , but trajectory was really bad. I Lurk here, to learn better casting methods, and new innovations. However, I would strongly suggest taking a good look at the link provided by Mello. I was excited to see an Airgun section here a long time back, and was wholly disappointed to see it was then discouraged, even scoffed at, to even think about casting for airguns. Even though a member here had been successfully shooting long range (hundreds of yards) for years. A And willing to share his knowledge as to how and why. The Link provided by Mello will hopefully turn a light on in what seems to be a complete misunderstanding of what airguns and projectiles are capable today. I was shocked at the lack of practical knowledge on the subject here. For instance. 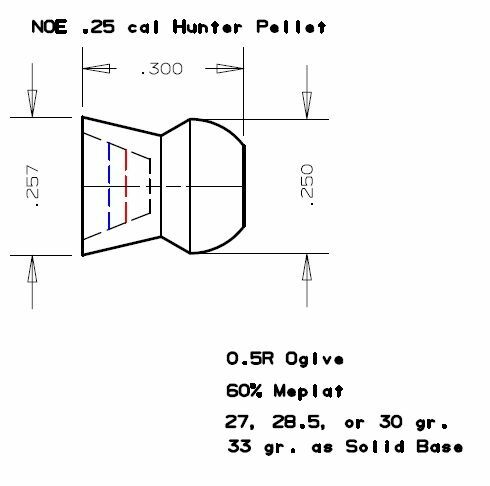 Why are NOE molds over priced for a pellet mold. Well, it is the construction. Why aren't the NOE castings as accurate as store bought pellets. In the first place, there is no such thing as a premium store bought pellet available much of anywhere in the US that is a true premium pellet. The top hunting and long range pellets are from JSB. Period. Not Crosman, Not Benjamin, (Same company, Not Gamo. We all know how hard it is to cast very small bullets. Pellet are much-much harder due to the very thin skirt. If you can cast a good quality pellet, regardless from what, you are a True Pro Caster! To expect the everyday caster to match the top, most researched, most tested pellets from the top pellet swaging company in Europe, is folly. Come on Guys! I suggest often, budding pellet and slug casters for High power AirGuns to come to Cast Boolits to learn the craft. I would advise the same to the airgunners here. Take a Trip over to the GateWay to Airguns and open your minds. Lots to learn there. For Instance, just for an eye opener, there is no such thing as a high power, high velocity springer airgun that works for anything much past 1- 20 yards A pellet cannot by design stay stable in the transonic range for more than a few yards. Much less at anything approaching a decent distance. Break the sound barrier, and all bets are off. A good PCP can shoot under an inch at 100 yards. Shoot a good bbl, with a good bullet, and 1/2" and under are very common. Not even the most expensive springers can do this. You will also note that none of the top quality airguns advertize velocity. None. They all know that hyped velocity numbers are for trappint the unwarry at the typical Big Box Stores. Such guns are pure junk. Pure an simple. Read, research, listen, and don't assume anything is magic. It's not. One thing that always bothered me. I love the Blackout. Why have so many had such a lackluster accuracy from them. If I can shoot regularly 3/8# at 100 yards, and 1/4" ctc from my custom Talon/Dor look!/Dor .257 with 110 NOE spire point bullets, Lyman/Ideal .257 338, and 3/4 from the 84 grain NOE Ranch dog bullets. Is there still an issues with the Blackout? A good friend of mine who shoots long range with both bullet shooting ag's and his black out, has no issues what so ever shooting 1/2 moa at 200 yards with his Talon/Dor or 1 moa and less at 100 yards. Haven't looked at the Black out results in over a year here. Would assume it has been conquered here? For better visuals of what happens whe a wasted pellet is shot in excess of 880 to 930 fpe, this can be eyeopening. The faster the pellet is fired, the worse the unstability. although not shot at the speeds of many from the big box store ag's, the effects are already horrendous. You can imagine what the results are going to be like with them. Can you hit a tin can at 10 yards withone. Probably. With some pellets. Can you take out the O in a Tomato soup can at 30 to 50 yards. No. At 60 yards, be lucky to hit the bag the can come in from the store. LOL! Now who here depends solely on luck in their loads and shooting? Your comments and the comments on the video are generally true but not true across the board. 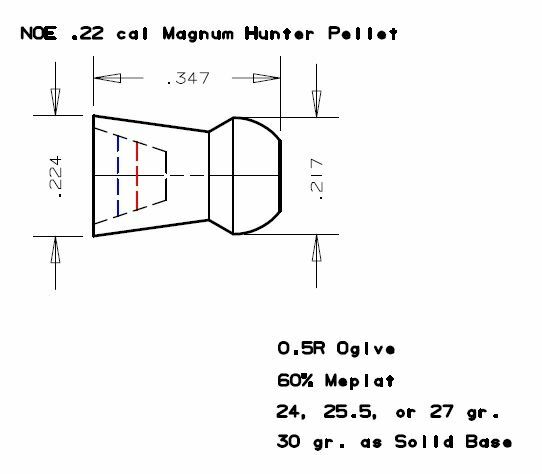 The video in question showcases a .177 caliber shooting ultra high velocities with very light weight pellets. My .22 caliber PCP shoots the 14 grainers with velocities hovering around the 950fps range. I get consistent accuracy out to 75 yards without any of the cork-screwing flight paths that are depicted by some as worse-case-scenario high velocity pellet shooting. My shooting range near the inner city is limited to 75 yards tops so I cannot attest to my accuracy beyond that distance. 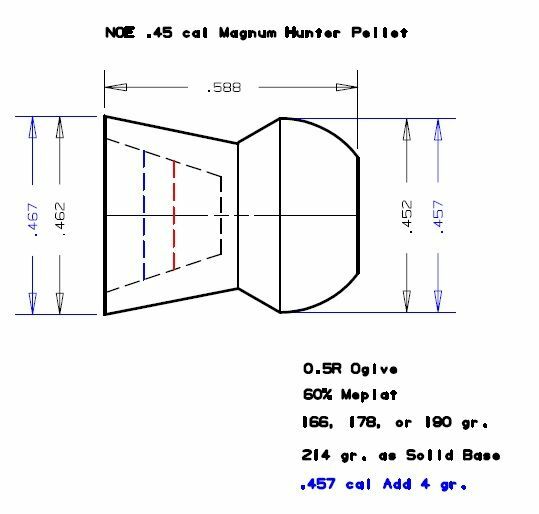 At any rate; because I too have believed the assessment of the high-velocity equals low-accuracy theory, this is really why my interest was peaked when I heard of the pellet molds being offered by NOE. There are a few things you can do to counter the loss of accuracy if that lack of accuracy can truly be attributed to your velocity being to high. One, if possible, is to lower the air output on your regulator so as to in effect, lower the velocity of the pellet. (like it was done in the video) The other, if possible, is to switch to a heavier pellet. 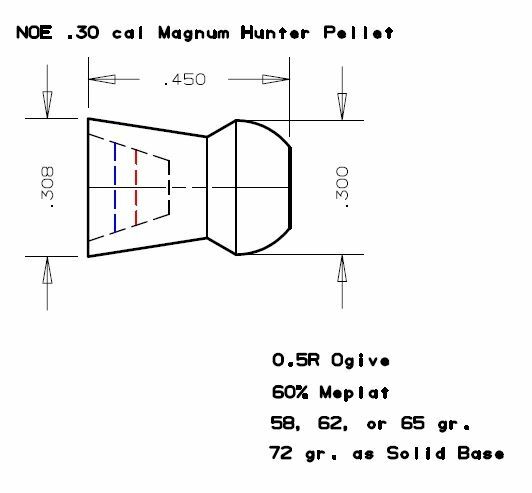 This too will lower the velocity; and in many instances it may increase the accuracy of the pellets being shot. At least that's what I'm hoping for if or when NOE finally releases the mold that produces the 20 grain pellet. I have no intention of lowering the velocity of my PCP, especially after all the time it took to figure out how to safely raise the velocity. I'm already getting good reliable accuracy with the lighter cheaper Crosman Premier 14 grainers. 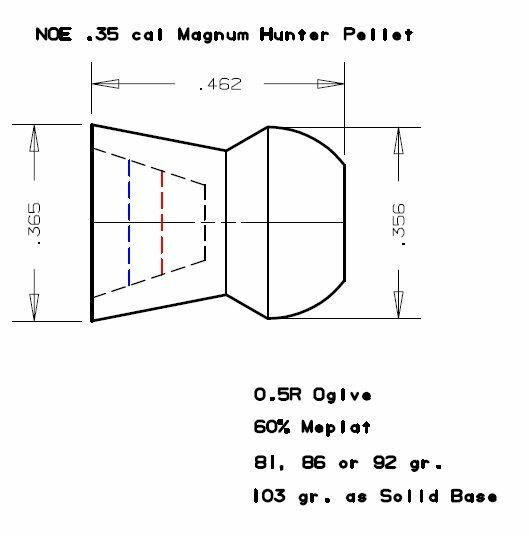 I'm hoping to be able to shoot the 18-20 grain pellets in the 900fps range. If I can get them to shoot in the mid-900s, that would be even better. Interesting. My grandmother used to have a huge problem with squirrels getting into her bird feeders. Wadcutters were excellent at those close ranges with a match air rifle. I probably killed 30-50 in high school with it. All headshots and no cripples getting away. No exits either but my thinking was with as little energy as I had, I needed full transfer of energy. It was accurate enough to kit out to 40 yards or so but on the one time I did shoot at one that far it only gave it a headache. I've never tested wadcutters out of more powerful, accurate airguns. I'd imagine that a 25 cal wadcutter would ruin a raccoon size animals day at close range. Reduction of overpenetration would also make it viable when you don't want to damage things behind it like sheds and playgrounds. Let's hope the rest of the upcoming molds will rival the accuracy of store bought heavies. I do not know if he is a member here. 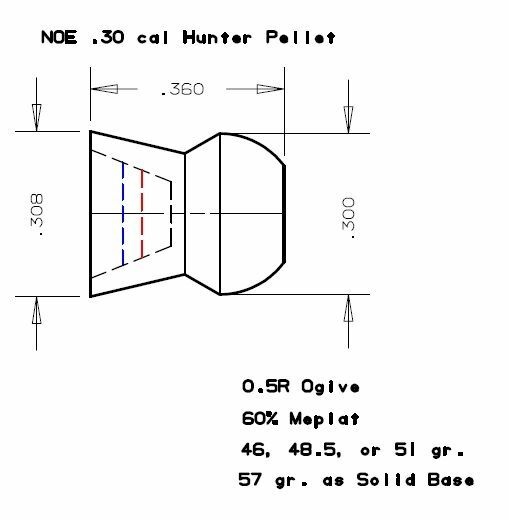 Is Noe going to offer the .45 pellet? I roamed around Noe and their forum but found no mention. 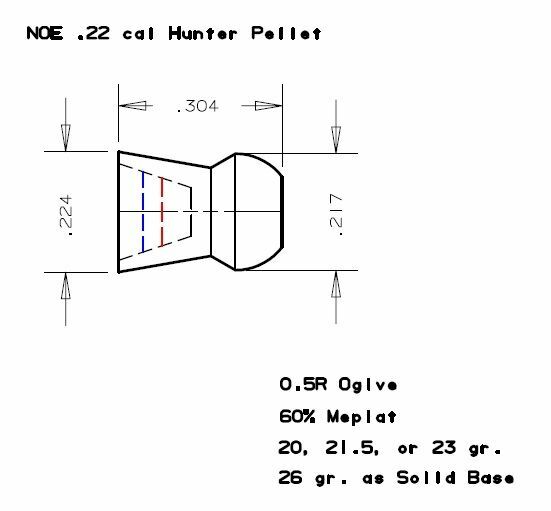 I'm still waiting for word on the 20 grain hunter pellet molds. I think that will be just the ticket for my PCP.